Besides traditional P2P voice and video communication, WebRTC has diverse application potentials and can be used for video conferencing and IoT-related applications such as remote diagnostics and security surveillance. WebRTC has diverse application potentials and can be used for video conferencing and IoT-related applications. The WebRTC-based ToGazer video conferencing application is only just the beginning. 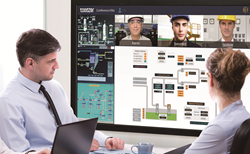 "Video conferencing represents a milestone for NEXCOM in the WebRTC application development space, but conferencing is not the sole purpose," says Perng. "ToGazer originally focused more on video conferencing features. However, ever since its public introduction, many users have been creative in using it to support applications such as call center, remote education services and online radio broadcasts. Take a call center application as an example: In order to provide online call center support, operators had to install expensive VoIP handsets and adjust the network to accommodate video and audio data, which is a complicated process and difficult to maintain compared to using WebRTC-based communication with just a PC and microphone." Perng emphasizes, "The WebRTC-based ToGazer video conferencing application is only just the beginning. In the future, a great opportunity exists for ToGazer to have a significant place in the industrial sector."